Today's ink is Monteverde Jade Noir, which is part of the Noir 10-ink set. I purchased my samples of ink from Goulet Pens. Jade Noir is available in 30ml bottles and cartridges. Jade Noir is a dark green. There is some lovely red sheen. I have noticed that a lot of green inks in this color range, including this one, look a lot more blue in large swabs. Other properties: Medium shading, low sheen, and no shimmer. Ink swabs for comparison, left to right (top to bottom for mobile RSS): Diamine Dark Forest, Monteverde Jade Noir, and Diamine Deep Dark Green. 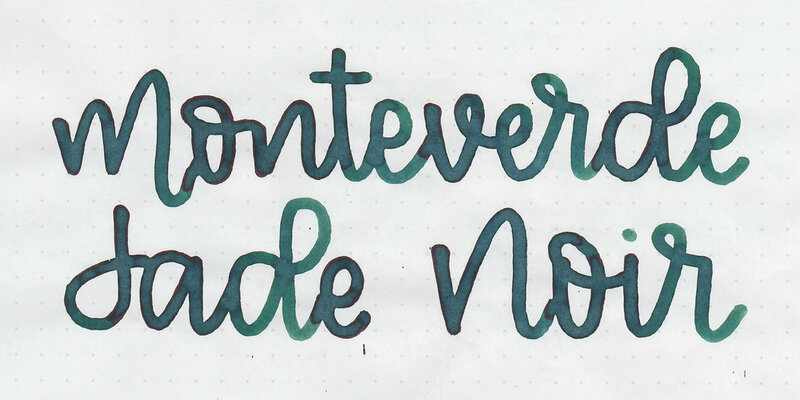 Click here to see the Monteverde inks together. I think Deep Dark Green is probably the closest of these ones. Robert Oster Moss, Robert Oster Green at Night, and Sailor Jentle Miruai. Click here to see the green inks together. I used a medium Pelikan White Transparent on Tomoe River paper. The ink had a wetter flow than average, which is lovely. Overall, I liked the wetter flow, and the color is lovely. Give it a try, you might love it.